Today I would like to welcome Kate who write at Essex Voices Past and is a contributor at Worldwide Genealogy. Kate is celebrating the publication of her book with a book tour and I am therefore delighted to be included on the tour. Firstly, I would like to thank Julie for allowing me to write a post on her blog during my week long blog-tour of history-related blogs. 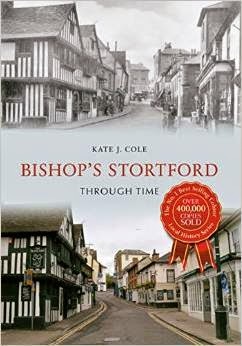 My tour is to celebrate the publication of my first local history book, Bishop’s Stortford Through Time, (a small market town in east Hertfordshire) and I’m touring the world, via the internet, writing about “all things family/local history”. Today’s post, on day 5 of my tour, is about using vintage postcards to help with family and local history. 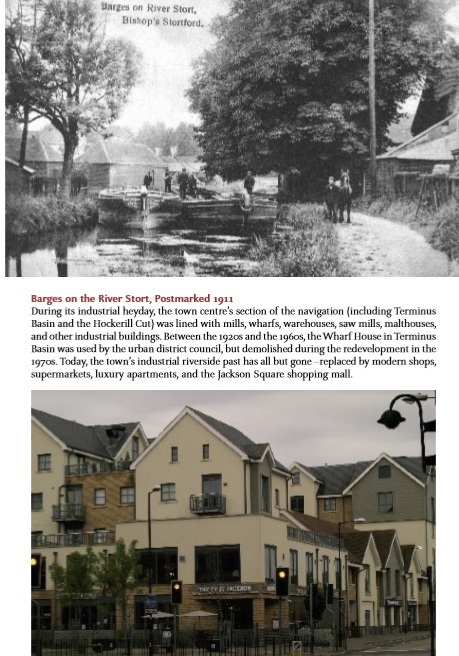 Throughout my book, I used vintage postcards to show “then” photographs of areas of Bishop’s Stortford a hundred years ago, compared with modern day “now” photographs. Comparing the “then” photograph to “now” can clearly show how a town has changed over the last 100 years or so. Our ancestors were prolific senders and receivers of postcards: small rectangles of strong cardboard measuring precisely 5½ inches wide by 3½ inches tall. There is a great deal of information on the internet about how these pieces of cardboard evolved into being one of the major forms of communication around the world, from the late 1890s right up to the modern age. The period of time today’s blog post is about is known as the “Golden Age” of postcards – roughly the late 1890s to end of the Great War. By the height of the “Golden Age”, there was (nearly) always a picture on the front, and the back of the card was divided into two sections. One the left side, the sender would write a short message, and on the right side there was room for the recipient’s name and address. The fronts of the postcards varied considerably: (nearly) anything went – from cute pictures of fluffy cats, to risqué pictures of half-dressed beautiful young ladies, to views of local towns and villages. Collecting vintage postcards from this “Golden Age” can greatly add to your own family and local history research. It’s probably obvious what benefits the use of vintage postcards with scenic street views or social history photographs can have to local and/or social historian: being able to see a town or village’s past through the lens of a contemporary photographer. But what about other uses for vintage postcards for historians? 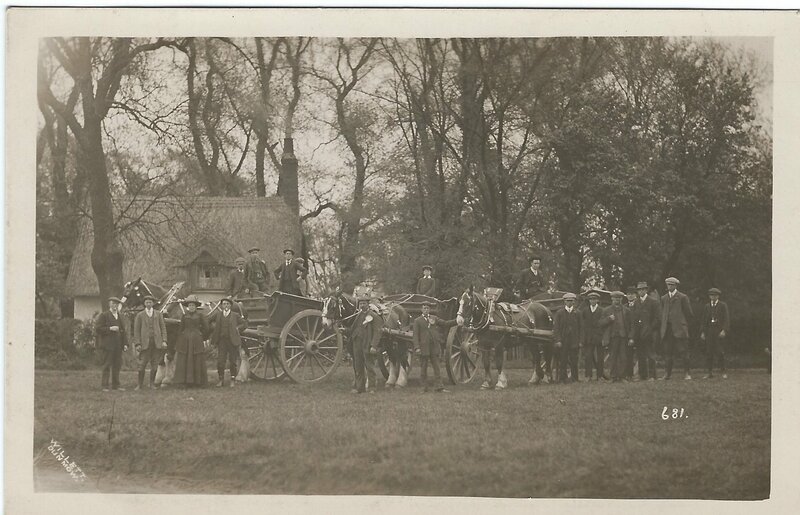 Social history postcard of Great Dunmow’s 1913 Whit-Monday Horse and Cart parade. A vision of a rural community before it was changed for ever by the horrors of the Great War. Hunting out your ancestors on the postcards of their local towns or villages as part of your genealogical research can be immensely rewarding. If your ancestors were well-known in their own locality, or were tradesmen or publicans, then you may spot your own family on vintage postcards. I have been incredibly lucky that my great-great aunt and uncle (my great-grandmother’s sister and her husband) were respected publicans and citizens of Great Dunmow, a small town in Essex. My great-great uncle was also an outspoken amateur politician in the years prior to the Great War. 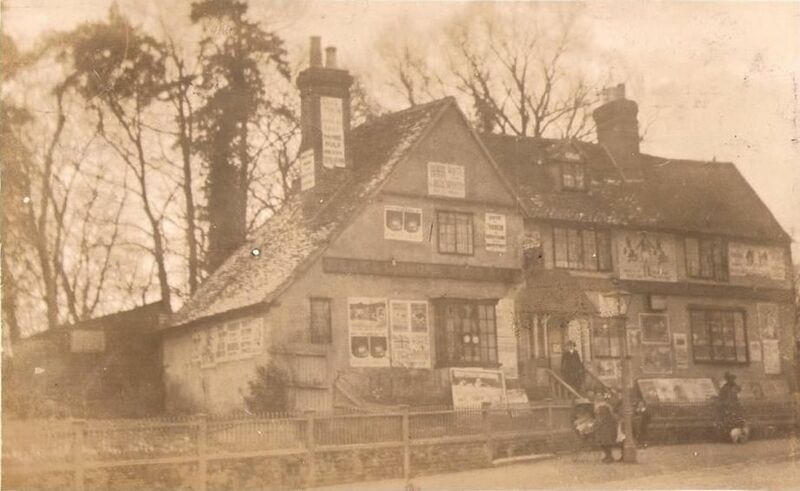 He and his family have turned up in many postcards of the town of Great Dunmow from the 1900s until just before 1914. I would recommend searching auction sites such as eBay and entering in the (hopefully unusual) surnames of your ancestors and/or the town/village they lived in. The Royal Oak public house in 1910 – covered in election posters. Its owner, James Nelson Kemp (my great-great uncle), standing in the doorway. Gordon Parnall Kemp (my grandfather’s cousin) in the family’s horse and cart outside his father’s pub, The Royal Oak. His father, James Nelson Kemp, is standing in the doorway looking at his son. A young man in this pre-1914 postcard, Gordon was killed in action amongst the blood, mud and horror of the Battle of Passchendaele in September 1917. If you look at the fronts of social history/street scene postcards and try to date the card’s view, you do need to be cautious when attempting to establish an accurate date. If the postcard has a clear postmark, do not rely on it being the precise date of the postcard’s view. Postmarks can only be a rough estimate of the date of the postcard – sometimes people purchased postcards but used them many years later. Or shops and photographers kept old stock for many years. 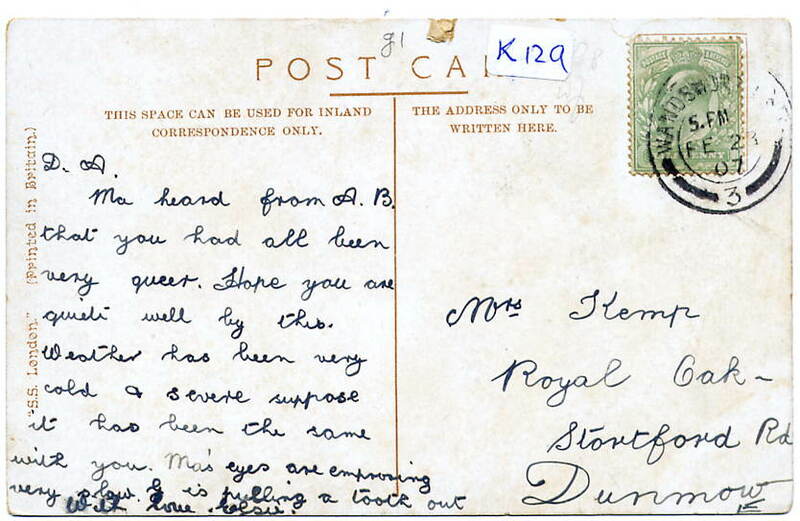 Therefore, postmarks (or a dated message on the back) are only ever the last possible date of that postcard’s view. This postcard of Great Dunmow’s High Street originally caused me great problems identifying the year of the view. Finally, after I’d managed to compare it with other postcards of the same street scene and looked at the photographer’s own serial numbers, I was able to establish that although the message had been written on in 1918, the image was in fact from the early 1900s. 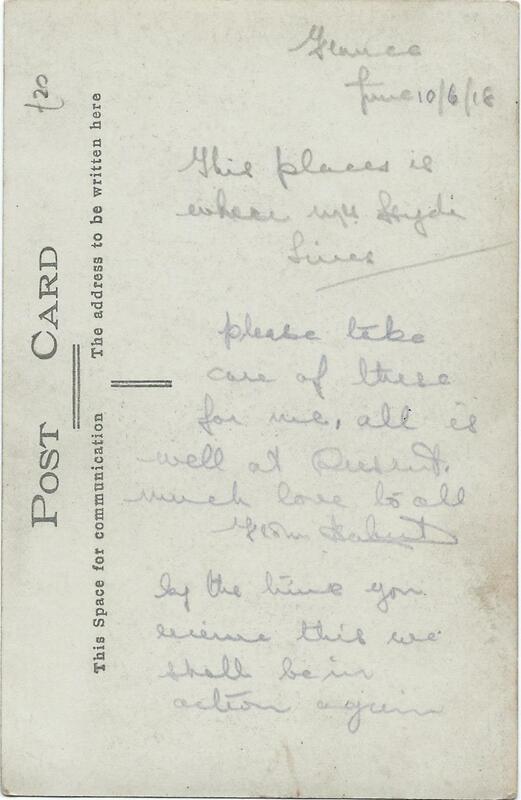 Because of the serial number on the postcard, it is likely that the person who sent the postcard had had it in his possession for many years, before finally sending it home from France in 1918. Each year I sell about 100 vintage postcards on that well known internet auction site and I post them back to (who I think are) their rightful owners. That is, people today living in the same streets, towns and localities as the address on the postcard they’ve just purchased from me. Recently, I got a real thrill of excitement when I wrote on a modern-day envelope the exact same address as the address on a 110 year old postcard, and then posted the envelope with its precious contents back to its original house. It really is well worth while keeping an eye out on the internet – you never know, one day your own house or photographs of your ancestors might turn up on an auction! I have a very large postcard collection but my all-time favourite postcard is the card below. It was purchased on the internet by the husband of my 2nd cousin – the great-granddaughter of the addressee on the postcard, Mrs Kemp. He sent it to me, the great-niece of the sender, my great-auntie Elsie. The “G is pulling a tooth out” on the message was my 7 year old granddad – a man I never knew as he died when I was two years old. It is incredible to think that 100 years after it was first posted, the descendent of the original addressee returned it to the descendent of the original sender. But not only has it had family value to me, but also local history because I have lived in Great Dunmow for the last 11 years –the home town of my ancestors. Elsie Parnall Cole’s postcard to her auntie, Alice Kemp (nee Parnall). Where had it been between the years of 1907 when it was first sent, and the early 2000s when it turned up on the internet? Hopefully I’ve now convinced you through my own research how much value vintage postcards can add to your family or local history research. But, were do you buy them? Well, of course there is that well known internet auction site. Vintage postcards on the site is one of the most popular (modern-times) way of buying. But, if you are looking for high quality excellent social history, then very often postcards on the site go for silly money – especially if there’s at least two of you bidding for a rare postcard. 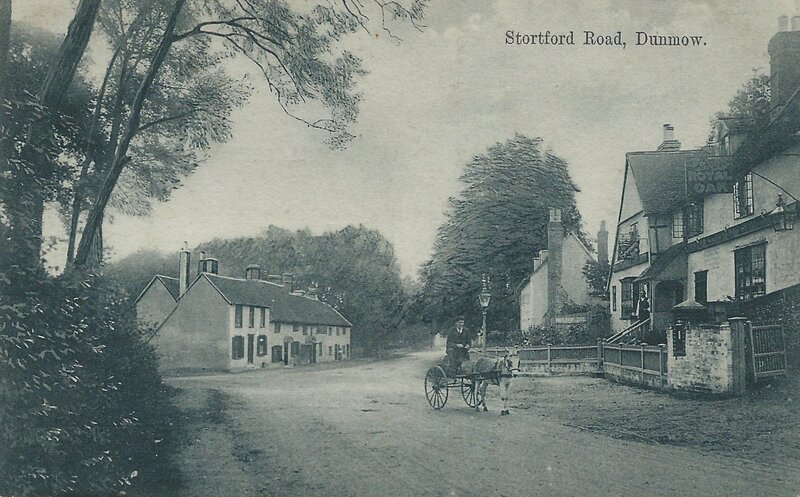 For my book, Bishop’s Stortford Through Time, I must have averaged at least £30 per postcard bought on eBay. One postcard in my book was being sold on eBay for £75 but I picked up my copy from a local postcard fair for £5 (not telling you which one!). Another Bishop’s Stortford postcard was being sold for £99 but I bought mine at another fair for £40. Prices vary greatly, with the better real photographic postcards exchanging hands for up to (and sometimes beyond) £100 per postcard on eBay. The other way of buying is the traditional postcard fair. Fairs are held in sports halls, leisure centres and schools all across the world, with anything from 5 to 100 dealers all selling postcards. I attended my first ever postcard fair in 1980 when I was 16 years old (in those days, good quality social history postcards were exchanging hands for £5 – a king’s ransom in those days – I so wish I’d had the money to buy them back then!). In my 40 years of collecting postcards, I have collected a wide and diverse range of postcards – from social history postcards to postcards by well-known Art Nouveau artists. The joy of collecting postcards is that your tastes and range of interests can change with time. If you are a postcard collector, what is your specialist topic? § Saturday 18 October – Worldwide Genealogy Blog: The process of writing a local history book. § Sunday 19 October – Essex Voices Past: Q&A session with Amberley Publishing on “how to get a publisher interested in your history book”. § Monday 20 October – Ross Mountney’s Notebook: Home education and teaching history to children. § Tuesday 21 October – Family History Across The Sea: Correlation between local and family history. § Wednesday 22 October – Anglers Rest: Using vintage postcards to add to family and local history research. § Thursday 23 October – Bishop’s Stortford Museum’s Blog: Oral history and Bishop’s Stortford. 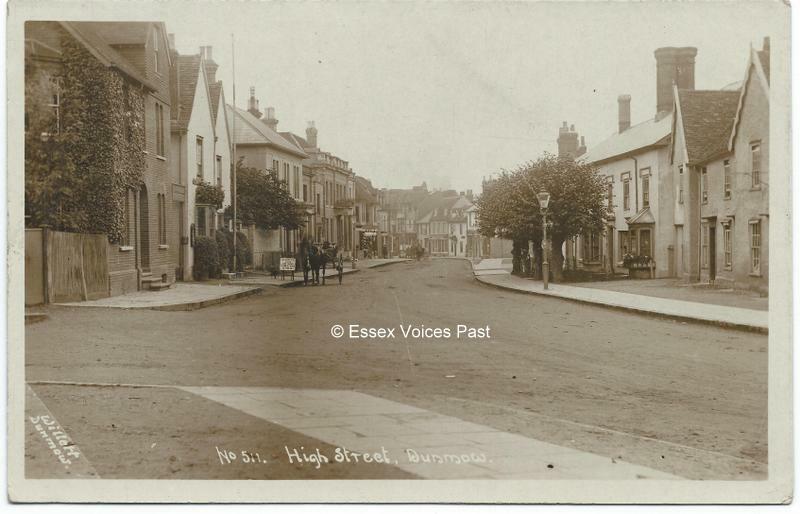 § Friday 24 October – Essex Voices Past: Bishop’s Stortford’s postcards which got away. § Postcards from the Front: Britain 1914-1919 (due to be published summer 2016). This entry was posted in Uncategorized and tagged books, Genealogy, http://schemas.google.com/blogger/2008/kind#post, Postcards. Bookmark the permalink.